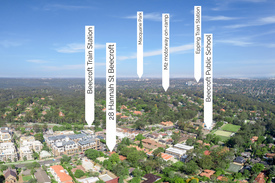 1 Commercial Real Estate & Properties in Beecroft are listed in 1 categories. We have 1 Medical and Consulting PropertiesSale . On the fringe of thriving Beecroft village, this beautifully kept character property is a truly rare residential plus commercial offering on a sprawling 1,453sqm land holding. Brimming with possibilities at the crown of Beecroft Village in a high exposure position opposite new Beecroft Place Shopping Centre and a short walk from the railway station, the commercial component offers a long established medical centre with current tenant on a long term secured lease plus the opportunity to occupy an additional 80sqm approx. commercial area, while the sprawling four bedroom family residence is perfectly nestled behind with independent access for uninterrupted peace and privacy. An incredibly valuable thirteen car spaces with easy access off Beecroft Road completes the picture. 28 Hannah Street is a truly versatile offering appealing to occupiers, super funds, and investors alike. Occupy the home and benefit from a secured annual income, position your business in part of the commercial space, do both, or have the property fully leased and see a healthy return (fully leased gross return based on previous occupancy and current residential rent appraisal $145,380 plus GST where applicable). Positioned to sell, this is the crown jewel at the gateway to Beecroft, and a never to be repeated opportunity. Figure is approximate, property is currently partially vacant, gross return excludes owner expenses, past performance is not an indicator of future returns, actual income may vary.